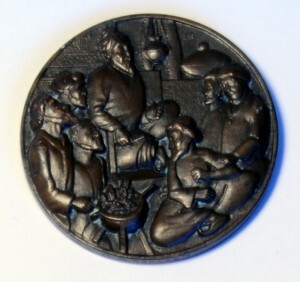 Two photos for the front and back of an interesting Al-Zahrawi bronze medal recently acquired from e-Bay yet with no available information on its date or occasion of issuing, neither from the vendor nor from the internet. The front engraving shows Al-Zahrawi holding an instrument in his right hand perhaps his invented straight catheter. He is surrounded by a group of six persons seated at a slightly lower lever, most probably being his students. In front of one of them is a pot on a stand. It is not clear what the contents are and hence the purpose of the pot cannot be reasonably guessed. 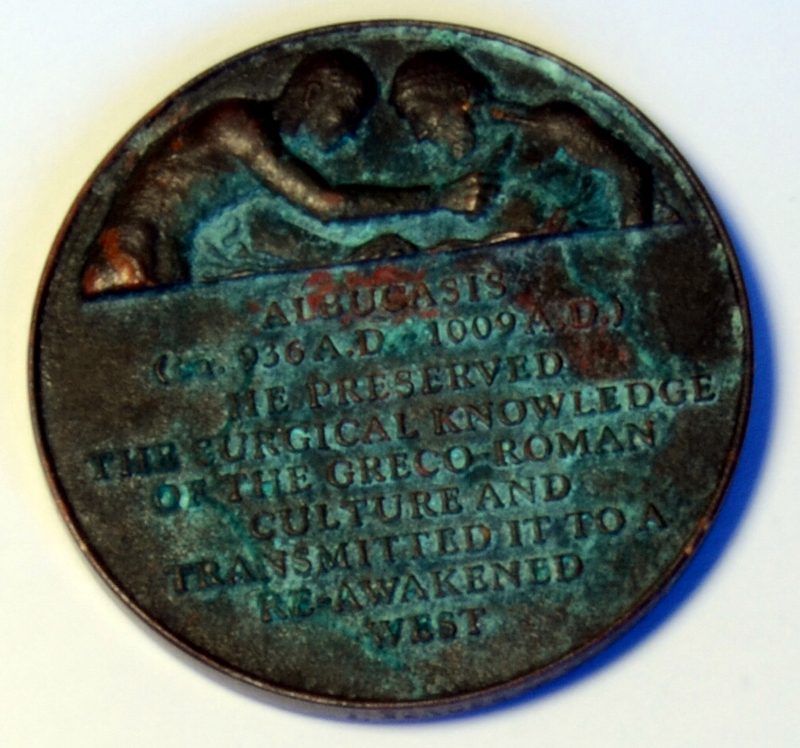 Inscribed on the back of the medal is the following text: “Albucasis (cc. 936 A.D. – 1009 A.D.) He preserved the surgical knowledge of the Greco-Roman culture and transferred it to a reawakened West.” . Although the more accurate date of Al-Zahrawi’s death is 1013 and despite the fact that he was not a mere compiler or just a transferor of knowledge, that medal is worth including with the other material in this Al-Zahrawi Millennium page. It is very much appreciated if any of the respected visitors who have more information about that medal could kindly contact us..
A memorial plaque commemorating Al-Zahrawi invention of the straight urethral catheter made of silver. A model of the catheter is shown together with the page from an original manuscript of the thirtieth maqala of Kitab Al-Tasrif showing the illustration of a straight catheter and other instruments together with the text describing, in details, the technique of catheterisation. 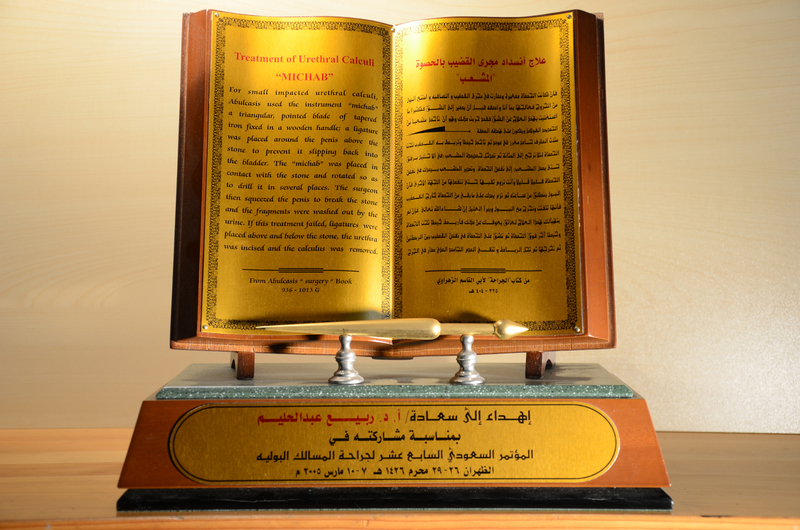 The plaque was presented as a gift to guest speakers at the 18th Saudi Urological Conference held at King Abdel-Aziz University, Jeddah Saudi Arabia (21st-23rd February 2006). A memorial plaque commemorating Al-Zahrawi invention of the Michaab, a primitive lithotrite he used to crush an impacted urethral stone without the need for cutting. 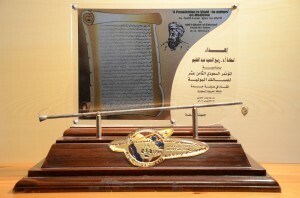 A model of the catheter is shown together with the text in Arabic with an English translation describing the operative technique introduced by Al-Zahrawi’s Tasrif (the Arabic text includes an original illustration for the Michab). The plaque was presented as a gift to guest speakers at the 17th Saudi Urological Conference held at The Military Hospital, Al-Dhahran, Saudi Arabia (7th – 10th March 2005). In the Annual International Congress of the Spanish Urological Association 2013, two brochures and a video authored by L.A. Fariña-Pérez, M.Pérez-Albacete e I. Otero-Tejero, were shown to commemorate the millennium anniversary of Al-Zahrawi’s death. The video titled: Abulcasis (936-1013) , El Gran Cirujano de Cordoba En El Milenario de Su Fallecimiento can be seen on the following link https://www.youtube.com/watch?v=owEO1Y6P0kk . We do apologize for being unable to translate it from Spanish to English. Pediatric Urology 1000 Years Ago (HTML). Lithotripsy – A Historical Review (HTML). Please click here to see an online recently published extended version of this article. The Earliest Pediatric Surgical Atlas. By S.N. Cenk Buyukunal and Nil Sari (2005). 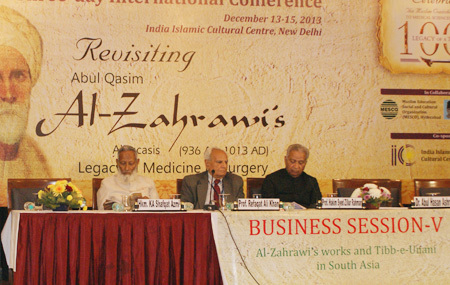 Al-Zahrawi (Albucasis): The Great Andalusian Surgeon. By: Sharif Kaff Al-Ghazal (2007). Islam Forgotten Contributions to the Progress of Medical Science: By: Ingred Hehmeyer and Aliya Khan (2009). 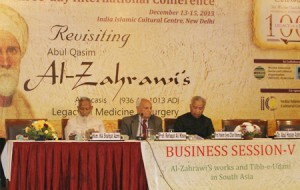 Abu Al-Qasim Al-Zahrawi the Great Surgeon. 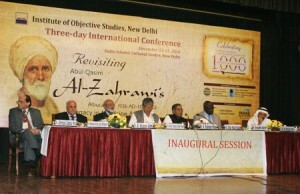 By:Dr Ibrahim Shaikh (2010). One Thousand Years of Missing History. By Salim Al-Hassany (2010). The Turk Physician Serefuddin Sabuncuoglu Author of Cerrhhiyetu’l Haniyye. [The book is the 15th century Turkish translation of Al-Zahrawi’s thirtieth volume of Al Tasrif on Surgery and Surgical Instruments plus 2 original chapters and added unique diagrams by Serefeddin]. By Osman Sabuncuoglu and Salim Ayduz. (2010). Pioneer Physicians. By: David W Tschanz (2011).